Take Action, Sign the PETITION! Open Letter to President Duterte, DFA Secretary Cayetano, Mayor Joseph Estrada, NHCP Rene Escalante, Senate and the House. GIVE RECOGNITION to the Comfort Women as part of our National History. 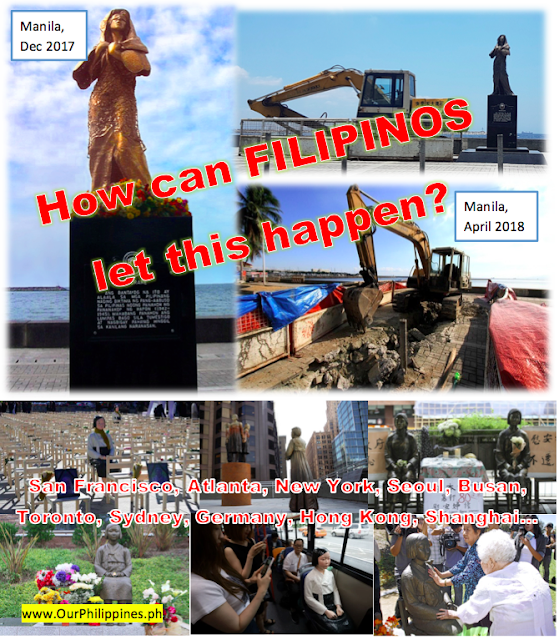 RE-INSTALL the statue in a Prominent Public Space to uphold the dignity of the Filipino people, in solidarity with the global movement of Comfort Women memorials. How can our country allow Japan to build a shrine for the Kamikaze Suicide Bombers in Pampanga that massacred Filipinos yet remove the only statue that memorializes the Filipino comfort women, abusing her again under the cover of night? Would Japan remove its war memorials in Yasukuni Tokyo because we, or even the US tells them to? The Comfort Woman Memorial on Roxas Boulevard is not intended to insult the Japanese people. In fact, many Japanese extended their support to our cause, and we are in solidarity with all who fight against the revision and whitewashing of history! The Japanese people understand well the virtue of upholding the dignity even to the death! We can do no less. Japan will respect us more for standing our ground. Japan will not jeopardize our relations and drop its expensive railway projects, although they may threaten to, with its economy in recession for decades, geopolitical interests in the area, and Japanese Prime Minister Shinzo Abe mired in corruption scandals. Japan needs the Philippines' projects. Like criminals who can’t face the light of day, some corrupt officials in the Department of Public Works and Highway with right-wing Japanese forces and greedy businesses illegally removed the Comfort Woman Statue at Roxas Blvd near midnight April 27, 2018. This is a desecration of our history. This is an insult to our National Character. We call upon the Filipino people to embrace and protect our history. History and Character are the BACKBONE of every SOCIETY. Our generation is only a trustee, like a torch bearer that provides light and direction to the next generation. No threats of unfriendly relations, economic sanctions, pullout of ambassadors, abrogation of sister city agreements budged Seoul, San Francisco, New Jersey, Sydney, Canada, Germany and other countries where the comfort women statues stand. Are we not equal in value with them that we have to bow so easily? We cannot be the object of pity and disdain for the world. Japan even dared to put their war memorial in the country they invaded, enslaved, and murdered! Many Japanese officials, including the right-wing Prime Minister Abe, even dare say that comfort women are natural in war as if organized government slavery is acceptable and called the them “paid prostitutes”. We reject this and remind humanity that violence against women is unacceptable under any circumstances. NEVER AGAIN! Peace-loving Filipinos must condemn all attempts to control our history by right-wing officials from Japan and any other country. China and Korea continue to be Japan’s major trade partners despite their continued efforts to demand justice for the victims and refusal to succumb to Japan’s pressure to remove the dozens of Comfort Women memorials they have set-up. The recall of the Japanese ambassador in protest to the installation of a comfort women statue in front of the Japanese consulate in South Korea was quickly rescinded by Japan. The Koreans not backing down got them more respect, even more benefits from Japan. We extend our friendship to all, Japan among them. Good relations with Japan should not come at the expense of burying our history. We should not betray and allow the abuse of our Lolas again. We Filipinos must learn to stand up for our history. WE OWE it to our lolas, to oursleves, and to our PAST & FUTURE GENERATIONS! "Ang hindi marunong lumingon sa pinangalingan ay hindi makakarating sa paroroonan." The Comfort Woman Statue at Roxas Blvd that was removed clandestinely under the darkness of night on April 27, 2018, only five months after it was erected, was a memorial to the suffering of women and girls estimated at 200,000 to as much as 400,000 in the Philippines and all over Asia who were forced into military sexual slavery (“Comfort Women”) by the Japanese government during World War II. Filipinos in solidarity with Lila Pilipina, Gabriela, Memorare Manila, Historians, Professors, and other organizations and individuals in solidarity for the truth and peace.